2016 was a great year for ZooTemplate. Thanks for your credibility for our business and we will keep on growing on 2017. As you might know, we’re based in Hanoi, Vietnam. Here we use Lunar Calendar (along with the Gregorian Calendar) and the Lunar New Year is coming. Vietnam together with some other Asian countries will be celebrating the lunar new year 2017 – the biggest holiday in a year. Therefore, we are off from Jan 25 to Feb 1, 2017. During that period of time, we will occasionally answer the support tickets. Our team will reply within 24 hours and we will come back on Feb 2, 2017. 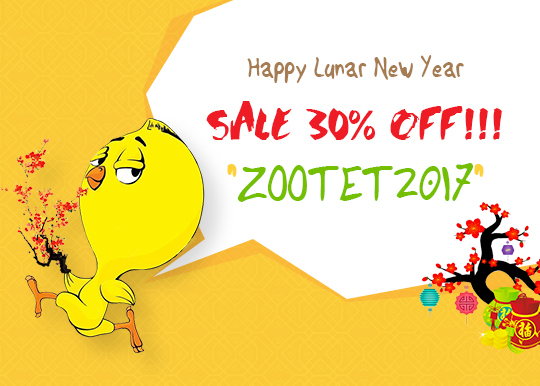 In this occasion, we will discount 30% for all membership package with coupon code ZOOTET2017 from Jan 24 to Feb 01, 2017. We’re looking forward to seeing you after our traditional holidays!